Home > Shop By Brand > RUPES Polishers FREE SHIPPING! > Rupes LHR 12E Duetto Random Orbital Polisher FREE SHIPPING! Makes vibration and noise a thing of the past! The Rupes LHR 12E Duetto Random Orbital Polisher is a smooth-operating dual action polisher with the power necessary to remove swirl marks and scratches. Italian-engineered for a perfect finish, the Rupes LHR 12E Duetto Random Orbital Polisher will polish your vehicle’s paint to an extremely high gloss finish without putting unnecessary stress on your arms and back. Rupes polishers are known for their smooth operation, and the LHR 12E Duetto is no different. The Rupes LHR 12E Duetto Random Orbital Polisher and its compact design, powerful 400 watt motor, and massive 12 mm throw will make this versatile car polisher a vital component of every detail. The Rupes LHR 12E Duetto doubles as a sander and a polisher! 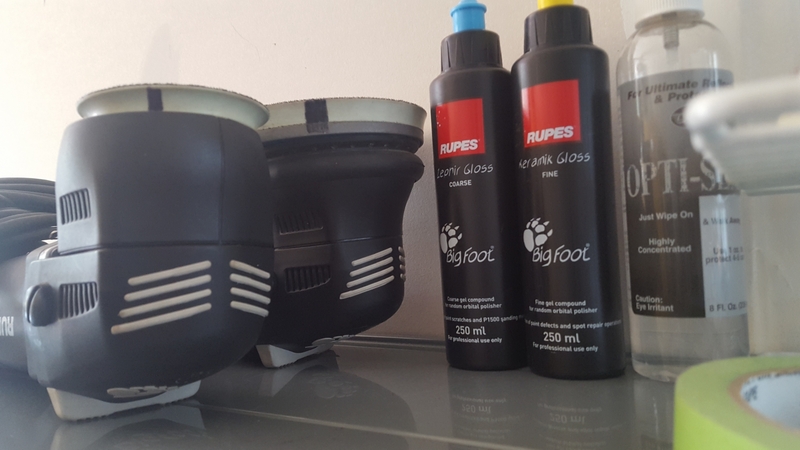 The Rupes LHR 12E Duetto is the result of countless hours of research and development to design what is arguably the most user-friendly dual action polisher available. Building upon the legendary "Big Foot" moniker set forth by the larger and more powerful LHR 15ES and LHR 21ES, the Duetto continues the Rupes tradition of engineering polishers that have a larger orbit (throw) than anything else on the market. The LHR 12E Duetto, the little brother to the larger LHR 15ES, features a respectable 12 mm orbit, enabling it to be a sander and polisher. 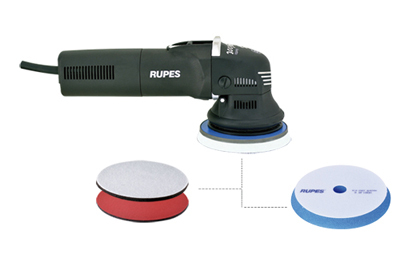 The Rupes LHR 12E Duetto includes a 5 inch backing plate designed to be used with 5.5 and 6 inch pads. 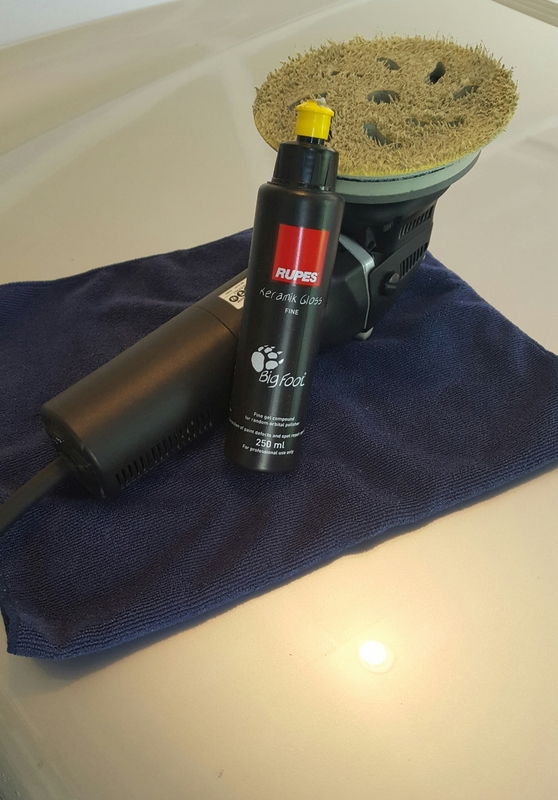 Rupes is a company that takes customer feedback seriously, and the LHR 12E Duetto is proof. Designed with the professional detailer in mind, the Rupes LHR 12E Duetto is thoughtfully engineered with superb ergonomics and user-friendly switches and dials. The Rupes LHR 12E Duetto will provide hours of sanding and polishing with minimal user fatigue. The powerful 400 watt motor provides enough juice to keep the pad rotating, making the LHR 12E Duetto capable of removing heavy swirls, water spots, and scratches. The Rupes LHR 12E Duetto and its 12 mm orbit can be used with fine grit abrasives to speed up deep correction operations. 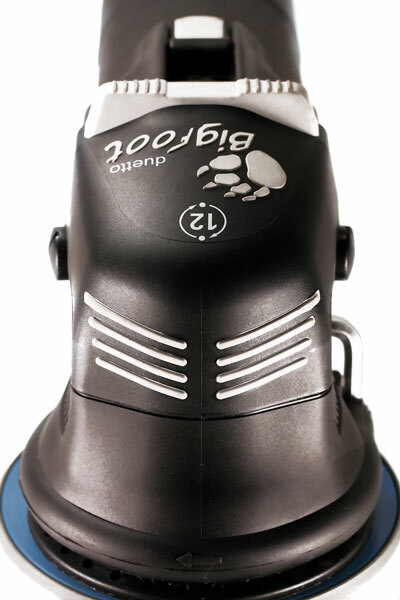 The tool can then use foam pads and polishing compounds to refine the abrasive scratches and restore a flawless finish. With its non-slip rubber inserts on the front cover, the Rupes LHR 12E Duetto is perfect for all polishing operations in difficult to reach areas. The operator can produce the best results possible with little to no fatigue. The dual function anti-spinning shroud is designed to protect the operator against the moving parts and act as a clutch for the backing plate, preventing further stress on the foam polishing pad when it is not in direct contact with the surface. Rupes LHR 12E Duetto Random Orbital Polisher Deluxe Kit FREE SHIPPING! RUPES LHR 12E Duetto Orbital Polisher Standard Kit FREE SHIPPING! Rupes Big Foot Random Orbital Polishing SystemRUPES Polisher KitsMike Phillips’ How to Use The RUPES Bigfoot Paint Polishing System Rupes Foam PadsRupes Microfiber PadsRUPES Wool Polishing PadsRUPES Mille Foam PadsRUPES Rotary Foam PadsRupes UHS Easy Gloss SystemRUPES BigFoot LK 900E Mille Gear Driven PolisherRUPES BigFoot LHR 19E Rotary Polisher Now in Stock & Ready to Ship!RUPES BigFoot LHR15 Mark III Random Orbital PolisherRUPES BigFoot LHR21 MARK III Random OrbitalRupes BigFoot LHR15 MarkII Random Orbital Polisher - On Sale!Rupes BigFoot LHR21 MarkII Random Orbital Polisher - On Sale!Rupes LHR 15ES Big Foot Random Orbital Polisher FREE SHIPPING!Rupes LHR 21ES Big Foot Random Orbital PolisherRupes LHR 75E Mini Random Orbital Polisher FREE SHIPPING!Rupes Bigfoot Nano iBrid Short Neck Kit FREE SHIPPING!Rupes Bigfoot Nano iBrid Long Neck Kit FREE SHIPPING! The Rupes LHR12E is one heck of a polisher, my 2017 Chevy SS is my pride and joy, only the best will suffice, and the Duetto exceeds my expectations, so smooth, it's a joy to work with!! Of all the polishers I've ever used, this one is my favorite. Equally at home sanding, compounding, polishing, jeweling, cleaner waxing, and waxing. One thing that is immediately apparent is the build quality, fit, and finish. Operation is refined and effortless. The compact size allows for extremely easy maneuvering around almost every surface of the vehicle. The Duetto features higher opm than even the new Mark II 21, and 15 tools. This increase in rotation helps make up for the lack of rotation. I have a difficult time seeing that much of an increase in performance of a 21 over the Duetto. Remember to keep the shroud lubricated. I personally prefer using this tool without any type of modification. I also prefer using Rupes proprietary pads and liquids. It has worked effectively in both production environments, high end retail work, and recreational home vehicle maintenance. The Duetto easily out performs any of the popular tools sharing it's body design, like the Porter Cable 7424xp, and Griot's Garage GG6. I want to say it does it's job in about half the time of the competitive tools. The Mini is a natural companion to this tool. I did not want a machine too big or too small, but has the power to do it all. Well, this is it. I used this with the Lake County 5.5 pads and it is amazing. Very easy to handle. Not loud at all. Does not tire one out.